On the surface, it might seem like selecting a new garage door is very easy. However, in reality, since this device is a vital asset, you need to carefully analyze and consider all your options before making a decision. After all, your choice will either improve the security of your home, or it will compromise it by leaving readily exploitable gaps. There are many factors that you need to consider before making a decision, in order to make sure that you are getting the best door for your home. Any homeowner would certainly want to go for a special design, but although a door may seem beautiful and unique on its own, you should consider how well it will go with the rest of your home. Your garage door will greatly influence the curb appeal of your house, so even if this may seem like a trivial matter, it most certainly isn't. Aside from the color, there are all sorts of different variations you can choose from, such as handles and front door-like layout, or even a carriage style garage door that will make you feel like you're back in the old west days each time you return home. It is also advisable that you consider panel designs such as raised, flush, and painted. Flush designs are textured flat and often mix into the rest of the door beautifully, while the raised ones have long or short layouts suitable for homes built in Colonial or Victorian architectural styles. A painted panel design contains a coated internal slope in a contrasting color. As a result, the garage truly stands out. Just make sure that the paint colors synchronize with those of the other doors, shutters, and windows of your home. It is better to have an insulated garage door that can better withstand extreme temperatures. 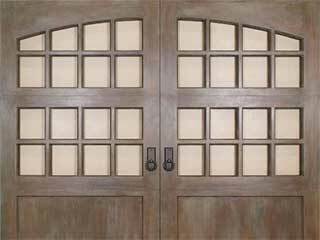 A wooden door can be a great naturally insulator, and it tends to be far more beautiful to look at. Steel is usually the more affordable option of the two. Steel garage doors are available in triple layers. The presence of more layers means higher durability, more insulation, and greater strength. It also means more weight, however, which means your opener will need to compensate for that. In case you will be using the garage as a play area or would be spending more time inside it, it is better to choose thicker layers along with other insulating features such as weather seals. Consult our professionals at Garage Door Repair Fort Worth to find out what other factors you may want to take into consideration. There are all sorts of unique safety and security features that often aren't considered when they should be.